One of my biggest goals with my next child is to make most (if not all) the nutritious, organic baby food that my new daughter will eat! Sage Spoonfuls has come to my rescue and will now make that goal very achievable! Sage Spoonfuls provides all the tools you need to make healthy, delicious and affordable food for your baby. As parents, we only want the best for our children. By feeding them homemade baby food, we are not only giving them the most delicious and nutritious food—we are laying a strong foundation for a lifetime of healthy food choices. You don't need to be a chef, have a lot of time on your hands, or a kitchen full of fancy equipment to make and store your own baby food—in fact you'll be shocked at how easy it is with the Sage Spoonfuls system. By spending just 1 hour every 2 weeks, you can have a freezer stocked with healthy and delicious baby food, made from safe, natural ingredients. Instead of going to the store to buy baby food, you can simply "go shopping" in your freezer! I generously received the The Homemade Lifestyle Package. 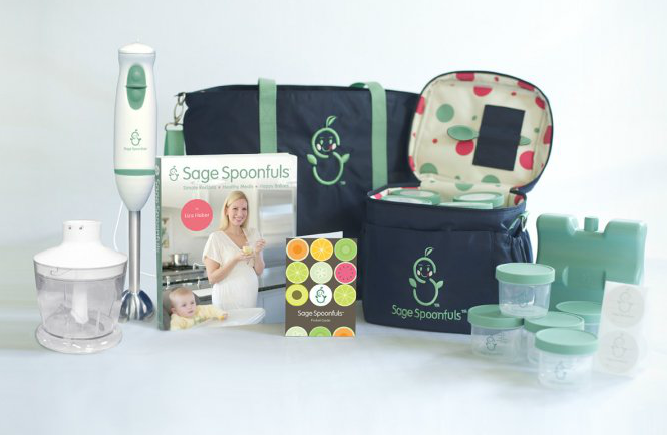 This package includes the entire Sage Spoonfuls collection in one package! This package gives you everything you need to live a homemade lifestyle with ease and makes a wonderful baby shower gift! 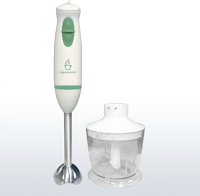 - Immersion Blender and Food Processor – purees a month’s worth of baby food in just seconds! All products are BPA, Lead, Phthalate and PVC free! Like I mentioned, I REALLY want to exclusively make my daughter's baby food this time around. With my first child, my son, I was in the "first baby daze" and did the best I could and made my own baby food when I could! However, I still bought my fair share of organic baby food from the store. What irks me is that I know I can make it cheaper and quicker and make it as healthy and diverse as I want! That is why I was so, so excited to learn about and receive the Homemade Lifestyle Package from Sage Spoonfuls! It has everything, and I mean EVERYTHING, you need to either get started as a novice food maker or reach your goals of exclusively feeding homemade baby food! My favorite item is the Food Processor! This is the item I lacked with my last child and my last attempts. It was such a hassle to get my blender out and it took a lot longer than it does with this awesome food processor and immersion blender! Plus, I can use the food processor for so many other things, including the regular cooking I do for my family! It is small and compact so it fits in my small kitchen (with no cabinet space!) but super powerful and easy to use! I also love the cooler and ice packs! This solves the problem of traveling and how to keep your baby eating healthy on the go but keeping your food cold at the same time! The Sage Spoonfuls book was also really helpful because it helped me remember about what food is good for what age and even included a good reminder on Infant CPR (which is really great for my husband who has never taken the course!)! If you have a desire to save money, make your baby food cheap and healthy, and save yourself shopping time, then you have got to check out all the Sage Spoonfuls products, especially the Homemade Lifestyle Package! It includes everything you need to be your baby's personal chef and build a great healthy eating foundation for them for the rest of their lives! Buy It: You can purchase the Homemade Lifestyle Package for $159.99 on the Sage Spoonfuls website. Win It: Sage Spoonfuls is generously offering (1) Homemade Lifestyle Package to a lucky winner! Oh my gosh! I need this! I made almost all of my son's baby food, but I used my blender or a magic bullet. They only worked OK... I think this would make it so much simpler!